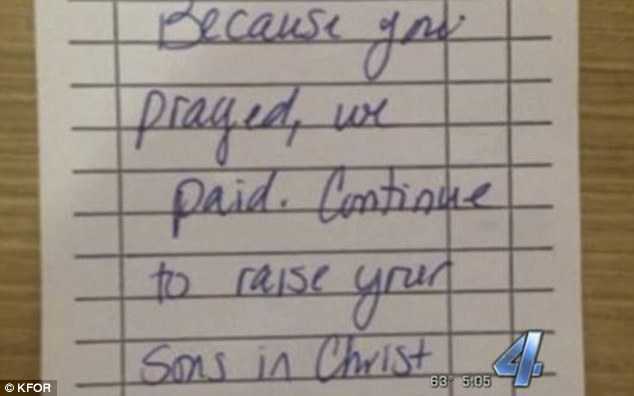 YUKON, Okla. — A stranger that was blessed in witnessing a family praying over their meal at a Oklahoma restaurant decided to secretly be a blessing in return by paying for their meal. The story unfolded at Jimmy’s Egg in Yukon, which is a popular breakfast spot in the area. Before the unidentified family ate their meal, they bowed their heads to give thanks, not knowing that others were watching. The family was moved by the kind gesture. “She (the wife) was about in tears,” Assistant Manager Sherry Thompson told local television station KFOR. The woman took a photograph of the note and posted it to Facebook, where the status has gone viral. The story has now spread around the world. As previously reported, earlier this year, a little boy from Alabama made headlines after he prayed with a homeless man after his mother payed for the meal at the boy’s urging. “God our Father, we thank you for our many blessings. Amen,” five-year-old Josiah Faulk prayed in song, as eleven other customers looked on at his kind gesture.